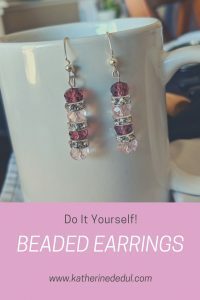 This week is all about beaded earrings. 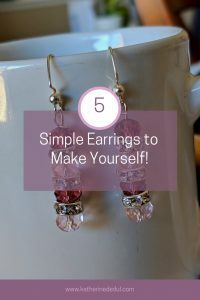 I like making earrings because while they can be tricky, they are also quick to make and make a thoughtful gift. 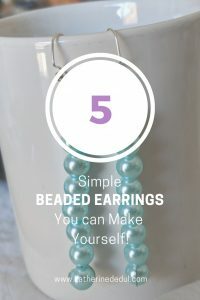 Also, if you have leftover beads from a larger project (like a necklace or bracelet), you can use them up here! 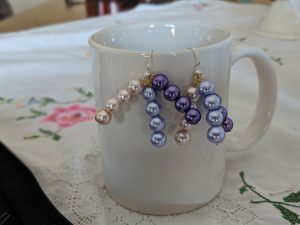 So this week, I decided to play around with my leftover beads and share the results! Another set of pliers (I find it useful to use another pair of pliers to grip your work sometimes). This one is a simple design. I attached the larger crystal with a split ring to an eye pin. 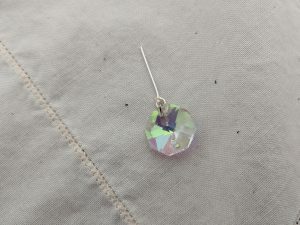 The smaller crystal goes on the eye pin, and you look it closed and then hook it to the earring hook. Repeat once more to complete the pair. 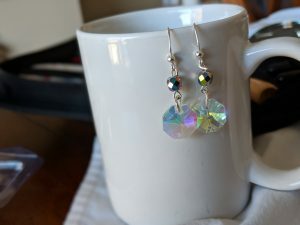 These are so easy to make, you take your head pin (Mine are 5cm or 2 inches) run your crystal beads (I inserted crystal spacers on these). You loop off your headpin and attach to your hook. 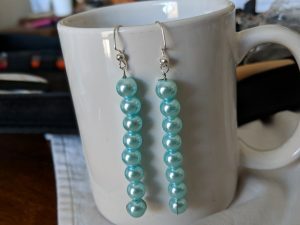 I decided to try a wiring method for these, and they turned out okay; I might add a bit more wire work to “frame” the lowest bead, but not too bad for just basically playing around with some jewelry wire and pearl beads! 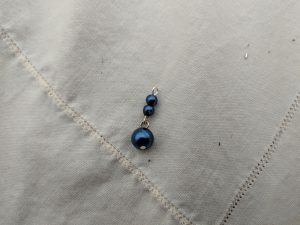 These were a bit more complex, using a head pin for the bottom pearl bead, attaching an eye pin, putting two smaller beads and looping the top, connecting another eye pin, larger bead (about the same size at the bottom) and finally looping that off and attaching it to your hook. The only thing I’d change is I started these and realized I didn’t have gold toned hooks (oops!). Again, next time around, I’d probably add some more loops at the bottom. Not bad for something I just threw together. 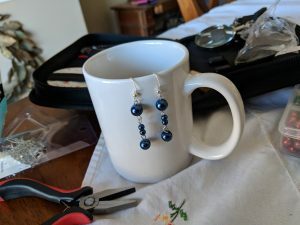 As I said in the beginning, earrings are great projects to rid yourself of leftover beads from larger projects, and they can make great gifts. They are also relatively quick to make and easy to put together. 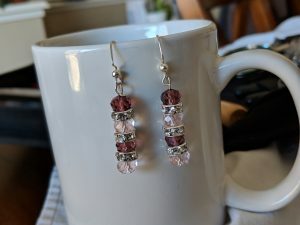 I spent just over an hour to make five pairs of earrings, and some of that was looking at my bead collection and pondering what the heck I’d make. I hope you found this entertaining; I’d love to hear from you, leave a comment down below. Also, please share this post with your network and pin it to Pinterest! Finally, check out my free printable workbook to finish that crafting project; all you have to do is drop your email down below! Next week will be all about the tools I use to grow my social media following and by extension, my traffic on this site. Until next time, stay crafty my friends!